When I started writing the book, I had so many thought on what to write and how to write, that where to write took a backseat. I started with a notebook that I began to maintain for the book, with different pages dedicated to characters, anecdotes and random one-liners that I could think of or recalled. That helped me developed the storyline, and then the actual writing part took off. But only for a while. As and when ideas occurred, I began writing them down- with the goal that I will put them all together in the notebook once I reach home. But that rarely happened. 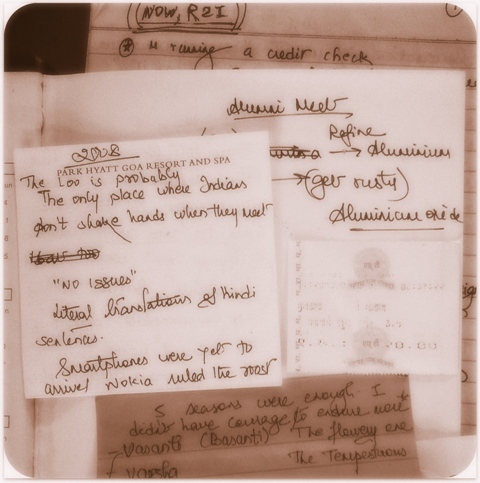 One fine day, I realized that I had several post-its, credit card receipts and every possible piece of paper, handbills included, where I had written down ideas for the book. One had voluntarily offered speaking points to one’s spouse regarding one’s organizational skills in the process. That’s when it occurred to me – why not organize everything- chapterwise- on Evernote? After all, I can always add to/ refer to the notes from wherever I am (work, home or on the road) or whatever the mode (laptop or phone). Moreover, as I type out each chapter, I can also maintain a backup. I am sure this has been tried by others before, but this is a new experience (and experiment) for me. And so far, it seems to be working. While I have not migrated away from longhand, this is a baby step. Previous Post Would you wait to finish the manuscript first?